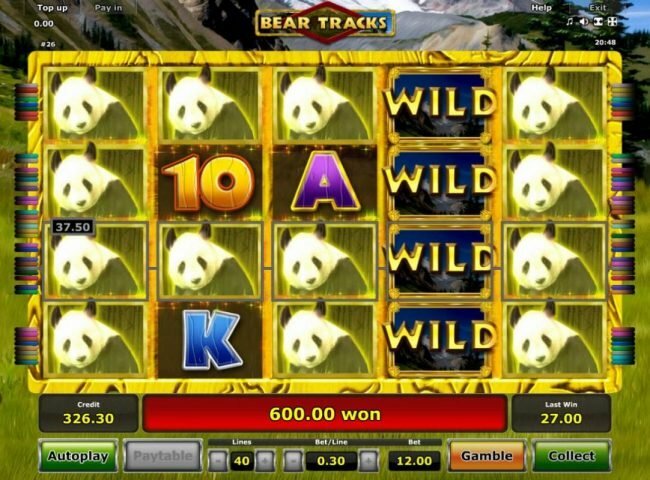 Bear Tracks is a 5 game reel slot machine with a top payout of $80,000 using the wild bear outdoor adventure theme. 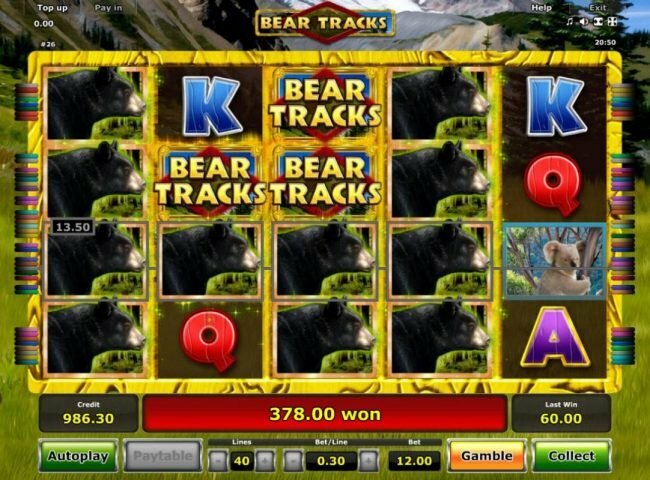 Bear Tracks Slots has not been reviewed yet, be the first to rate this slot. 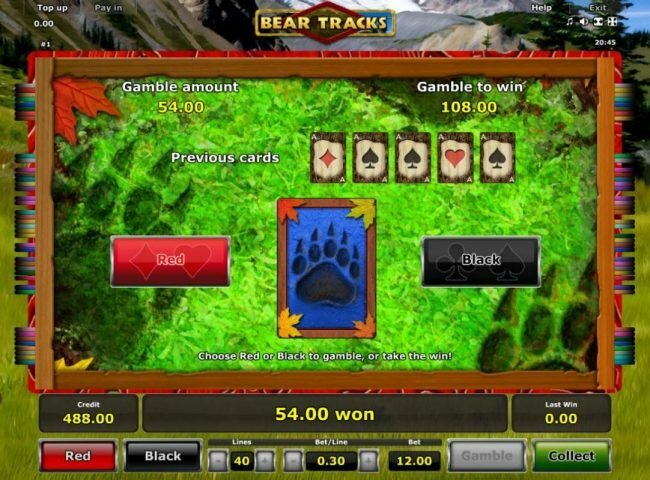 Bear Tracks is a Novomatic designed 5 reel, 40 payline video Slot that has users sent into the depths of a valley. Free Spins, scatters, bonus games and wilds will be found in this valley. As will a jackpot prize worth $80,000.00. The background of this game displayed the valley that’s surrounded by a group of mountains. Trees, grass, snow and bright blue mountains will act be displayed. 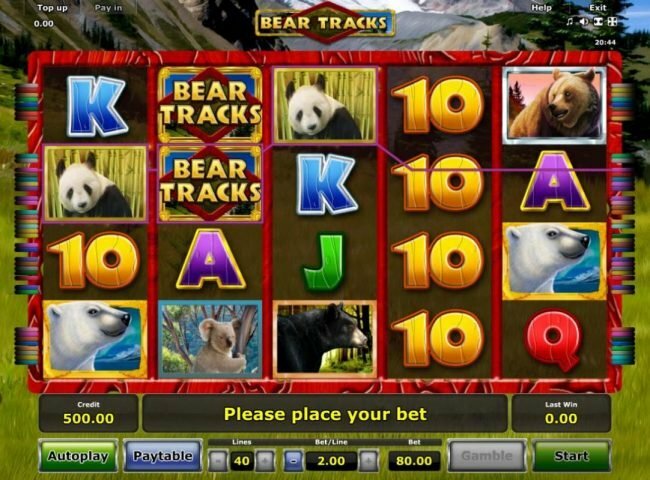 On the reels, Grizzly Bears, Black Bears, Polar Bears, Koala Bears, Panda Bears, game logos, paw prints and poker suits will be the available icons displayed. Through these icons, a more immersive environment is crafted. Novomatic has continually used the same betting selection in their games for years. As such, playing will be familiar with the abilities to alternate the paylines that will inevitably be played to decide the price will be comformtable. 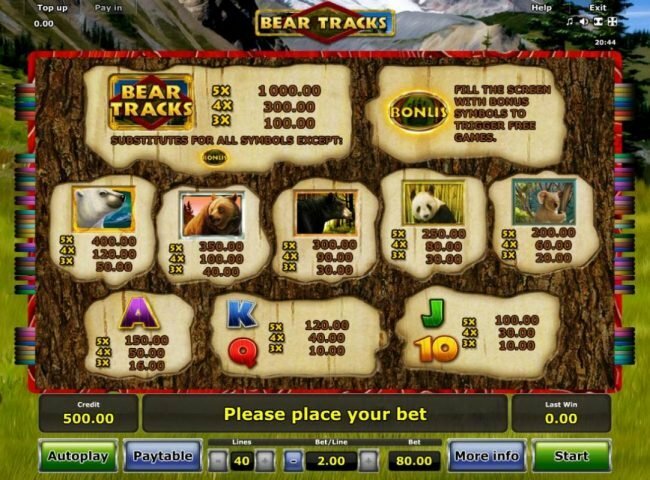 Line bets cost anywhere from $0.01 to $2.50. Anywhere from one to forty paylines may be active. Choosing both options are their highest limit will result in a $80.00 maximum bet. Wild substitutes come in the form of the games logo. This symbol present singularly on any reel will cause for multiple prizes to be awarded. This is done by the standard symbols being removed from the reels. 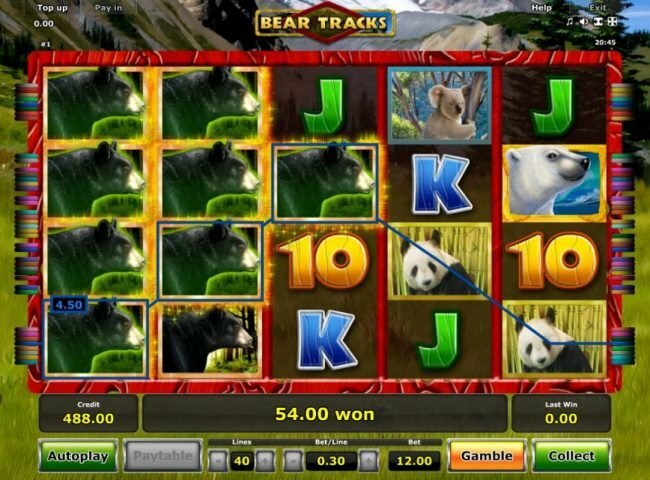 The Bonus game is awarded when punters have three of the bear paw print icons reveal themselves on the reels. 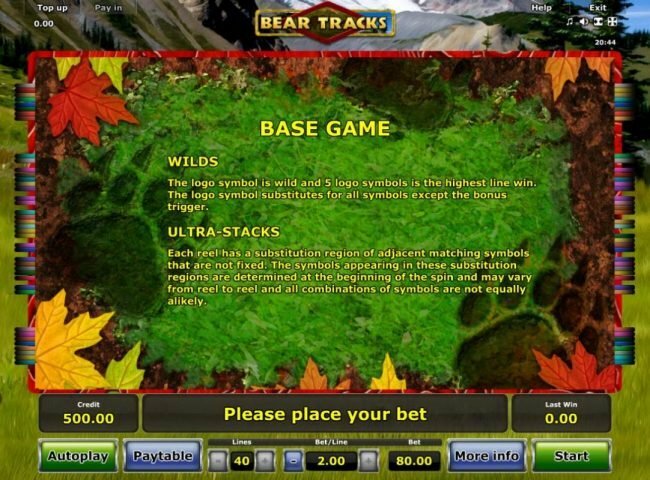 This has users given fifteen free games, during which if one of the bear icons are displayed in a group of five, stacked wilds will be initiated. 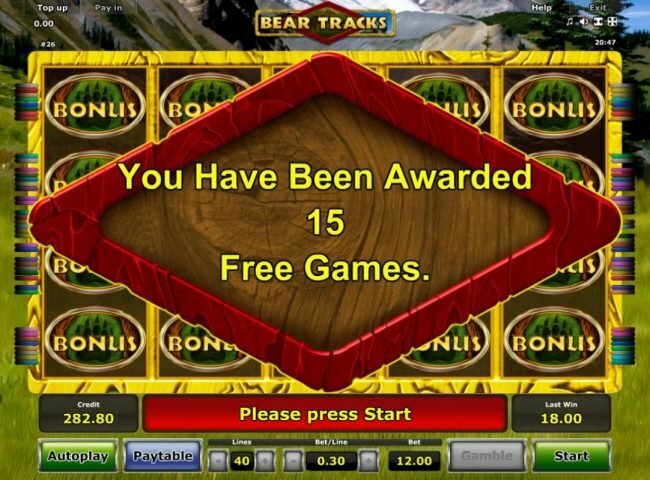 This will have the icons remain in place as the free spins continue. 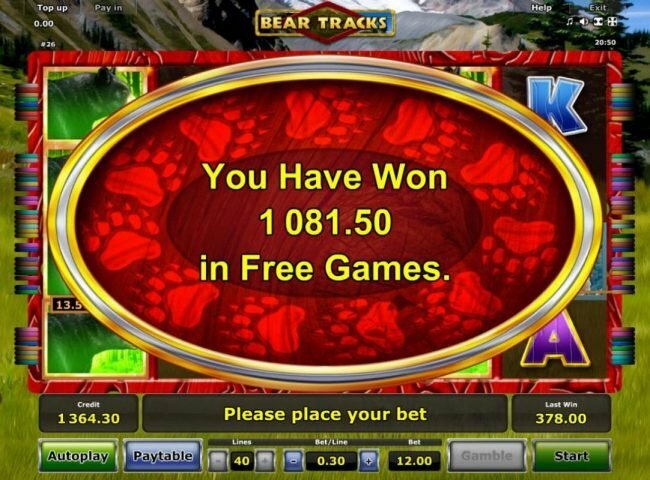 This can allow for high priced payouts to be awarded in a fast manner. Bear Tracks, it’s a game that at it’s heart is meant to be relaxing. At the end of the day, there are still moments of excitement though as big wins and features being won is inevitable. The theme helps to balance the excitement, resulting in the game feeling like a masterpiece.